I honestly don't know what I'd do if Frank wasn't around. We call him to problem-solve constantly in our two stores and in my home. These old NYC and Brooklyn buildings are gorgeous, but they're basically falling down around us. Add in a bunch of landlords' bad decisions, and you gotta have someone who can make things right. Over the years Frank has hung shelves, built storage systems, rewired buzzers, fixed leaks, repaired lighting systems, built entire display cases from scratch, replaced floors, painted interiors and exteriors, installed sinks, and did it all reliably, fast, and with a smile. His problem solving abilities are legendary. He never says "no" or "I can't do it" - he finds a way to educate himself about the issue, does research, and comes up with the best solution possible and then GETS IT DONE. He is the best. Don't hesitate in hiring him. 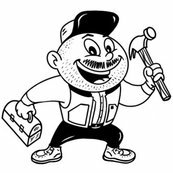 It took me 15 years in NYC to find a good handyman I am happy to say Frank is it. He's like a secret weapon!